Aiko's hair is long, one large braid of the beautifully, night-black hair runs allong her back or is sometimes kept over her shoulder, resting on her chest and abdomen. Her face is a timid, calm appearance, appearing carefully crafted out of a smooth clay rather than chiseled in marble or carved from stone, it's beautiful, not too pale, but far fram tanned or copper. She appears much like a princess, or a daimyo's wife out of stories of old. A grace follows her step, it's flowing, almost like a still river, never bumpy or irregular, it is almost as if she floated rather than walked. A memory from a person long ago lost, she wears an old rice-hat and her Haori has a small set of flowers embroidered in the front two lower corners. Although a highborn in most manners, and a caring, loving mother in others, she still retains one trait most people find most terrifying, or irritating, she is, for all intents and purposes, one of the most laid back people of the Gotei, preffering philosophy and caligraphy over fighting and swordplay. The sealed form of Izumiko takes the shape of a normal katana, the gripp a neutral blue in colour and the tsuba showing a man touching a mirror with a woman on the other side, also touching the mirror. The sheath of a shoto is also worn, however, no blade is placed within it, it is merely empty and worn together with Haruko, as if though the second blade has been lost. The blade grows clearer, the colour changing from that of normal steel to a complete mirror, reflecting every ounce of light that hits it. When Aiko swings Izumiko, small droplets of water are flung from its tip, as if briefly dipped before every blow, whomever these droplets hit grow weary and increasingly tired, untill at last, they fall to sleep. Izumiko weaves a rising spring around it, a small gush of water, hewn from the blade, much like a child dragging its hand in the water before flinging it at its friend, laughing. Should the water hit someone's eyes, that person suddenly finds themselves in a world that is… wrong. Right has become left, left has become right, up is down and down is up, wherever they look, they see themselves, they are not trapped, they are not locked, however, to them, it is like staring down the shimmering surface of a pond, reaching for that mirror image that they will never touch. The disorientation is oft times enough to kill whatever opposition outright, even if they do try and adapt to what they now feel. Aiko places both of her hands on the bare blade of Izumiko, holding it in front of her, uttering the call of "Ban-kai" before snapping the blade in half. The sound of the snapping blade ringing like a silver bell, softening all other sounds, drowning out the chaos with serenity as the sound of rain is heard. Rain starts to fall as the now broken blade reforms into a daisho pair, both blades as mirror-clear as the shikai form. The rain is soft, it's soothing for the senses and lessens the pain of an aching body, no wind, no harsh cold, but a mild summer rain, the kind that brings back memories from long ago. The type of rain in which you can cry and nobody would mention it. Sometimes when releasing, Aiko will take off her rice-hat for a brief second, feeling the rain against her face, commenting, "I can still remember him it seems." 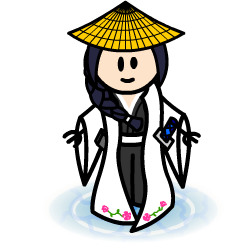 before putting the rice-hat back on. The droplets of the rain itself will tire, and eventually put anyone they fall upon to sleep, giving them dreams of times long past, happy ones, ones not tainted by war and bloodshed. However, the raindrops are far from powerful enough to instantly sedate someone of a higher level of power. In addition to the droplets, if Aiko touches someone on their skin with her bare hand, the person will fall asleep instantly. After a while, any person moved by the droplets will start to lose their path, their sense of direction muddled by the rain, and shadows will start to move, their targets will become less clear. Any of the two blades of Kumiko no Izumi can also throw the gushes of water from the shikai release, the desorientation and illusions all the stronger to the level where the enemy will now see multiple assailants where there are none, as if trapped inside a mirror gallery. Aiko can produce a cascade of water from the blade which absorbs any and all kido and cero based attacks, i.e. anything that isn't physical, these are later stored within the vast spring that is the spiritual world in which Aiko meets Izumiko, changing its appearance. Throughout her years as a captain, she has fought and battled countless hollows and opponents, and as such, the pond is filled with nearly unimaginable ammounts of power. Aiko can also unleash these from the Daisho pair, firing them off without incantations or any sort of charging time, she is even able to unleash more than one at the same time, although, due to the massive collateral damage such attacks would cause, she seldom releases even a single one.